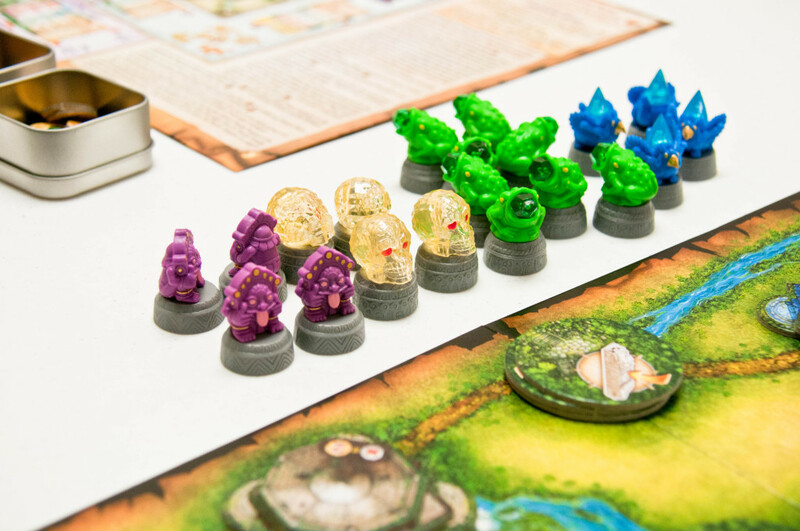 The game, Relic Runners, is all about competitive exploring in the jungle. 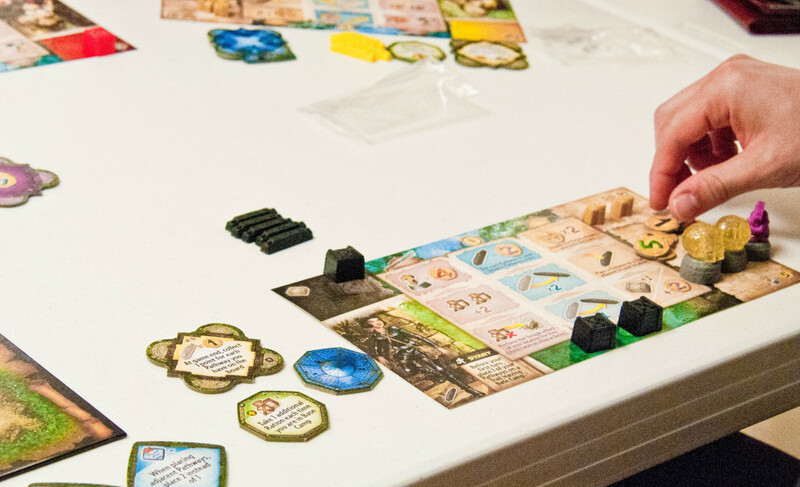 Each explorer attempts to lay out the most strategic paths in order to travel around the board, visit temples and shrines, as well as, collect relics. The mechanic is pretty simple: move once and take an action. The movements can quickly be increased by laying paths. Once a path has been laid out, then it can be used for free movements in the future. The more paths an explorer puts down, the faster he can move, as long as those paths are all connected. Other actions include exploring, moving your tool box (work toward gaining additional benefits), and returning to base camp to pick up more rations. Whenever a player explores a shrine (in order to lay a path) or explores a temple, he must pay one ration in order to do so. Another big part of this game is the Relic Run! 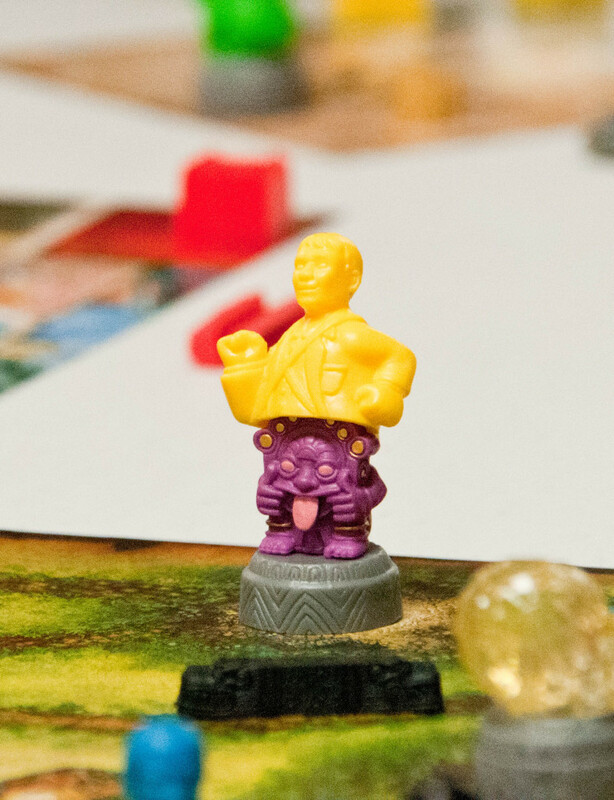 Once the shrines and temples have been fully explored and removed from the board, then relics show up in their place. Explorers must be able to connect one relic to another, of the same kind, via pathways in order to go on a relic run and collect one! Another plus for having long, connecting paths is that you receive double victory coins for the length of your trail between relics! Ready, get set, EXPLORE! 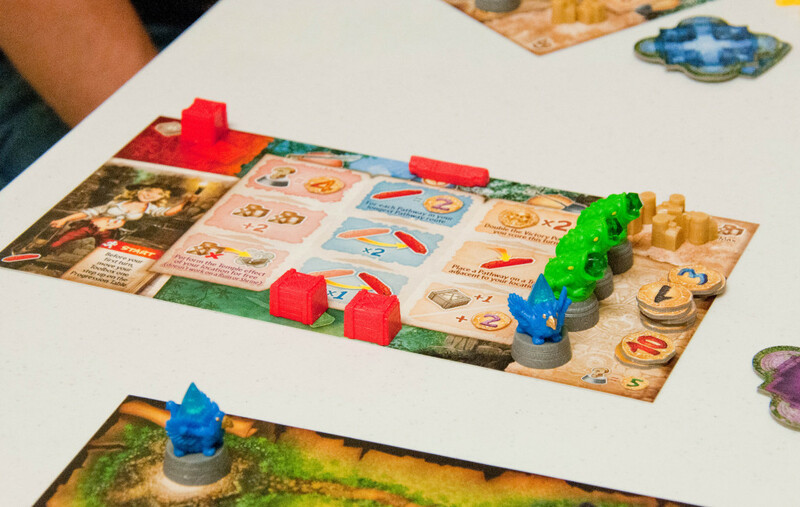 Everyone starts out in the center of the board (at base camp). Looks like Zach (blue) had already taken off running by this point! 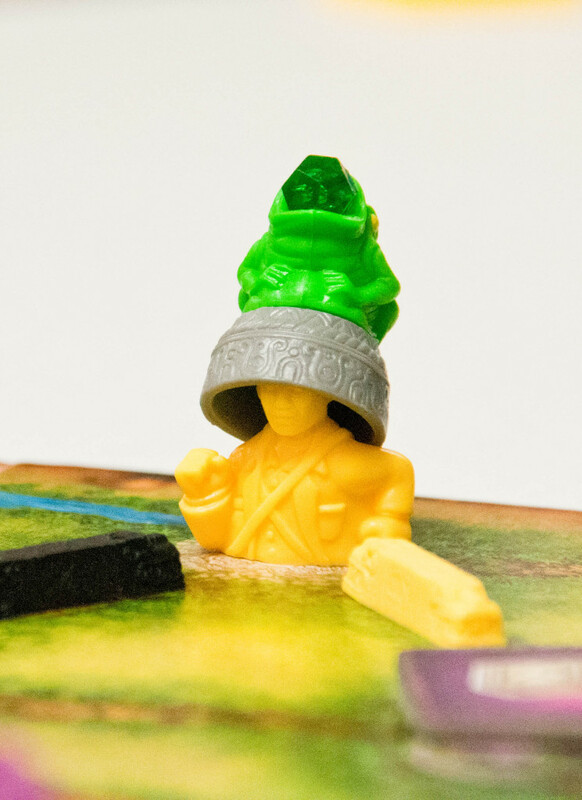 The Purpose of this Expedition: search the jungle’s newly discovered temples and shrines, lay down paths for easier movement through the terrain, collect as much treasure as you can along the way, and accumulate the most victory coins by the end of the game to WIN! 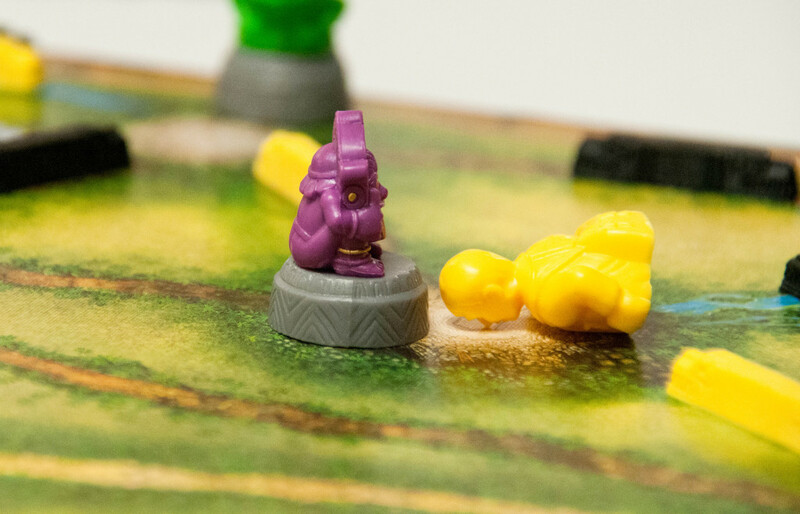 The explorers were traveling smartly around the board visiting purple temples for immediate gratifications, like instant victory coins, extra toolboxes, and special abilities. Visits to the blue temples were exclusively to gather victory coins, though these values were kept secret until the end of the game. 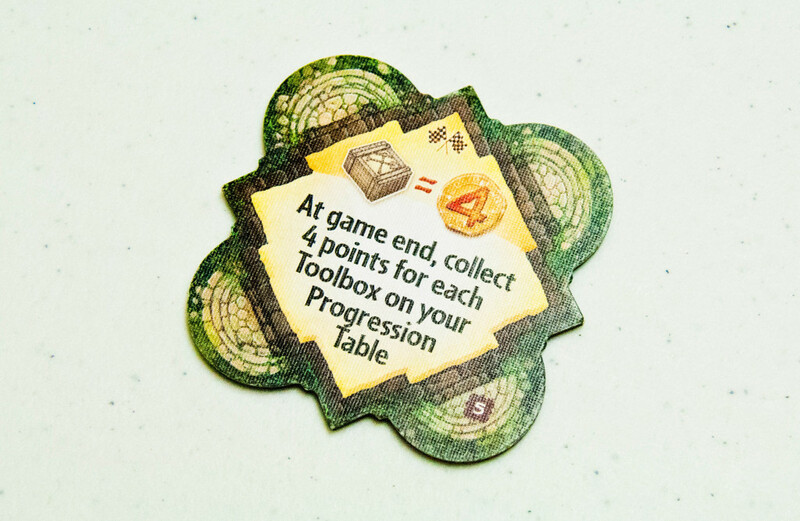 Some explorers dug up abilities at the ivory temples that allowed to them to take extra rations from base camp, or to place extra pathways, or to earn victory coins for laying paths or other such niceties; these were all ongoing effects that benefited them throughout the duration of the game. There were some pretty advantageous items hidden around the jungle! Then, there was that one particular explorer, who was so wrapped up in the visitation of the shrines and the laying of strategic paths…. that he ended the game with zero relics… but he sure looked like he had a plan and a vision every time he moved! I’m not gonna lie, this is where the game started to get a little loopy, as the explorers were obviously exhausted from their previous work adventures of the day…! 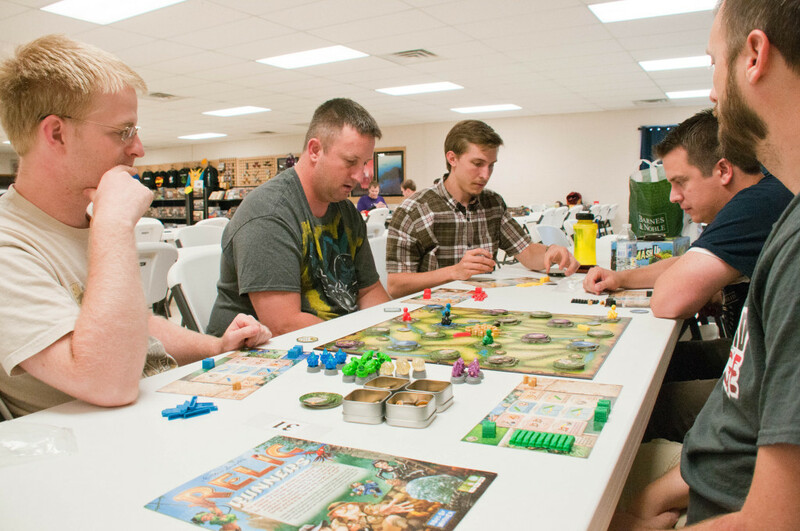 With a little bit of singing, some ornery pawn positioning, and a wee bit of storytelling added to the gameplay, you’ve gotta love a gaming group that knows how to have a good time! For instance, Matthew’s character, by no fault of anyone at the table named, ahem…. Zach… ended up with a frog headdress! Here, he’s bowing to the Purple Grimacing Juju – hoping that he’ll be able to claim it and sell it for coin. About halfway through the game, Sam had collected 3 relics, plus he had acquired several special benefits from exploring temples! Looks like he’d earned some victory coins as well! 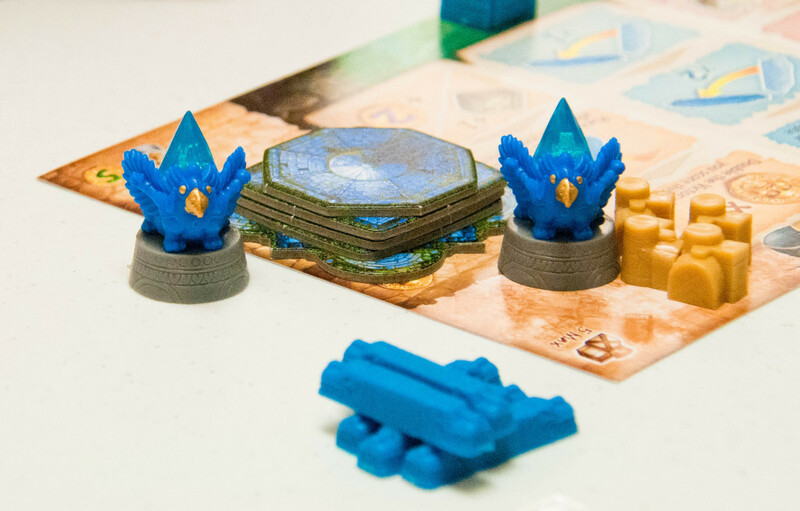 Zach, the blue explorer, was unintentionally collecting blue everything…! By the end of the game, the red explorer, Jason Z. ended up with a full card! And this little gem, from one of the ivory temples, helped him rack up some last minute points! But, at the end of the day, it was, in fact, Matthew, the yellow explorer, who pulled out a lucrative win with 62 points – CONGRATS!!! Some of us were just crazy enough to play another round…. Same mission, people! Let’s do this! Tiny Team Fist Bump for good luck! For the Relics! And, as it usually happens when I’m playing a game, I get caught up and forget to take photos… so all you get is this awesome, feel goody photo of the fist bump….! Let’s just say that I was very happy with the results of this game, even though some of the other explorers kept stealing relics right out from under me… I ended up winning this round! I will give credit to my sweet husband for revealing a path to me (at one point) so that my explorer, who’s last run had been thwarted, was still able to make a relic run AND score an additional 14 victory coins for a sweet, long path! All of the explorers dug up some nice relics and coins, had some nice conversations, got distracted by some friendly visitors at the table…. The details are all a blur! Good times! Good times! Gregg (blue) came in a close second with 49 points! Great job, babe! Way to redeem yourself! We had a competitive good time with Relic Runners! 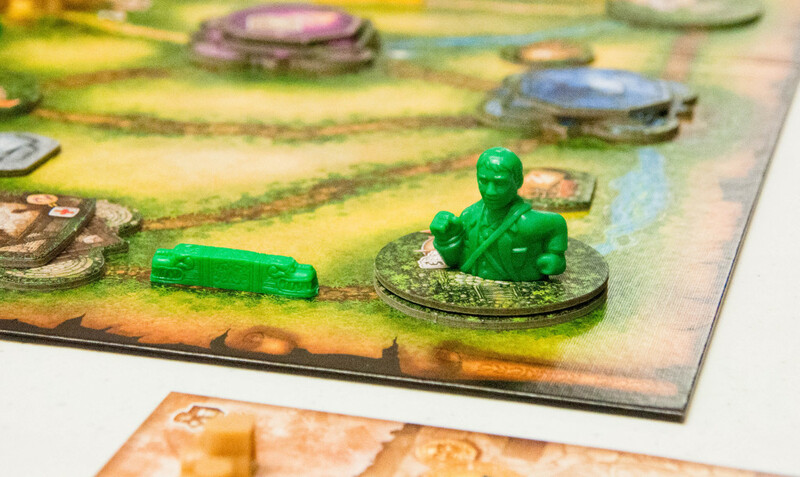 The game has a fun theme – who doesn’t like exploring temples and shrines for goodies and collecting relics? 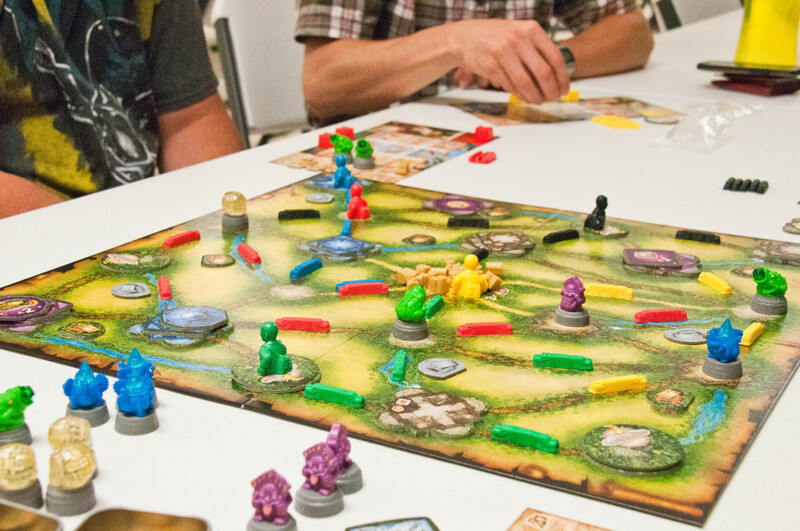 The board and components are very colorful and apparently provide for additional storytelling and posing fun…! Everyone seemed to catch on to the rules pretty quickly and each explorer seemed to have a different strategy for trying to win the game. Some went straight for temples, others laid long, intricate paths, a couple ran around doing a little bit of everything, and I can think of one, in particular, who kept binge eating his rations and running back to base camp to replenish. 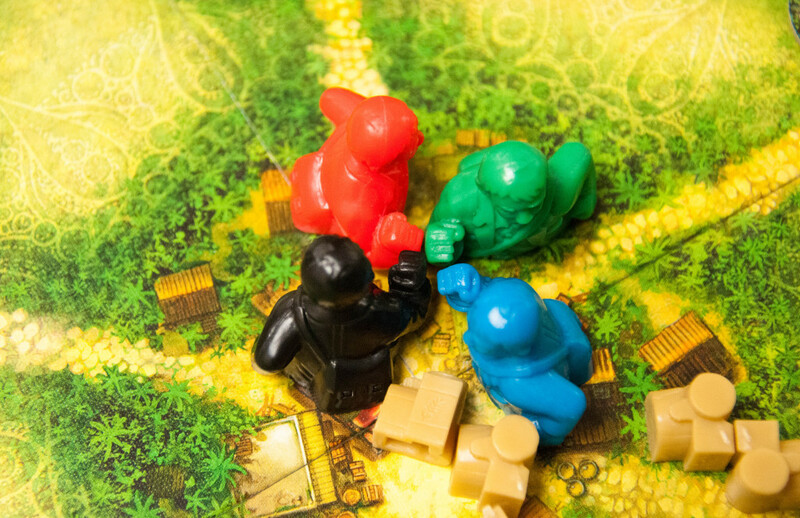 However, each one played, they made the adventure their own! Happy Adventures!